Have any of you ever heard of Alexandra Scott? Born on January 18, 1996, this young girl was diagnosed with neuroblastoma, an aggressive childhood cancer, two days before her second birthday. A short while later, while battling the cancer that was overtaking her body, Alex and her family decided to create a lemonade stand with the goal of raising money to help her hospital -- the Connecticut Children's Medical Center. By July of 2000, Alex had earned over $2,000, which she donated to the hospital to help fund cancer research and the purchase of much-needed medical equipment. Alex and her family moved to Philadelphia in early 2001 to pursue new treatment options, but she continued working to improve her lemonade stand fundraising efforts, and during her third year she raised over $20,000 for the Children's Hospital of Philadelphia, in honor of her friend Toireasa, who had recently lost her battle with neuroblastoma. 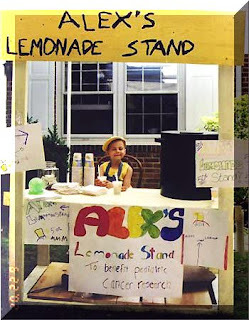 Then, in 2004, Alex set a goal of raising $1 million for her lemonade fund. With the help of friends, family and others supporting her cause -- all hosting lemonade stands in all 50 states and in several other countries -- Alex's goal was met. Sadly, on August 1, 2004, Alex passed away...but her fundarising legacy continues. In one recent 15-hour CBS-sponsored phone bank initiative held in Philadelphia (June, 2009), her organization raised $891,000. Can you believe that? $891,000 in fifteen hours! Since it's inception, her organization has raised over ten million dollars for the victims of cancer. Me? I'm just trying to raise $1500, for the The Ohio State University Comprehensive Cancer Center -- The James -- along with 2000 other cycling enthusiasts participating in the Columbus Pelotonia on August 29th, 2009. And why does all of this mean so much to me, you ask? My nephew was diagnosed with neuroblastoma when he was three years old...and after surgery, chemo, radiation treatment and a stem cell transplant...he beat the odds and beat the cancer. I spent a great deal of time in the Columbus Children's Hospital during his treatment, and I was amazed by the courage of those fighting cancer, and also the dedication of the individuals working so hard to improve the lives of others in the most difficult of circumstances. It seems surreal to me that it took me this long to act -- so many people are fighting similar battles this very moment, and they need our help. Researchers and physicians in Columbus helped save my nephew's life -- I was reminded of that today as I watched him diving into the pool on our annual family reunion and vacation in Hilton Head, South Carolina. One thought kept coming to mind as I thought of the entire experience -- it's time for payback.